There are a number of conditions on a rental property that can increase a landlord’s risk of income loss. Landlords have a duty to prevent injuries in and around their rentals. These rules — referred to by legal experts as “premise liability” — don’t just apply to injuries to tenants, but can include claims by other persons who visit or live near the property. Understanding how this liability could arise is the key to preserving profits. This is a commonly-overlooked area of liability for landlords, who may rely too heavily on the use of signs to keep tenants safe. Attractive nuisance applies to injuries to young children — people who can’t be expected to read warnings. 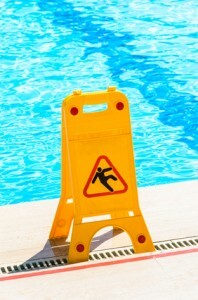 Because children cannot adequately assess the risk of injury, the landlord must anticipate those risks. Classic cases include injuries from swimming pools with inadequate fencing or gates, unattended fitness equipment, and neighbors’ pets. Children aren’t the only ones who sometimes fail to properly assess risk. Just last week, 55 people were injured when the floor of a second-story, four-room apartment collapsed under the weight of 100 party-goers. Investigators are considering whether the building’s occupancy limits were breached. Illegal activities create risks for landlords, in particular, those who have not routinely inspected the property. Fire and water damage may be caused by grow operations. Even where the tenant is running a legitimate business from the rental, this can increase the risk of injury both to tenants and guests, and may violate zoning laws. Every winter, there are examples of tenants who are injured or killed through use of improperly installed appliances. If the heat is malfunctioning or insulation is lacking, tenants may run space heaters from dangerous electrical cords. Barbecues stored too close to living areas easily spark fires. Sadly, many tenant injuries occur due to carbon monoxide poisoning, which can have been mitigated by installing and maintaining carbon monoxide detectors — a legal requirement in most states. Tenants’ pets can quickly become a liability for landlords. Here, it’s important to have a policy in place prohibiting aggressive animal behavior, and to act quickly to reduce risks of injury. If a tenant falls on ungroomed sidewalks in the dark, or is accosted as they leave the property, the landlord may be at fault. Outdoor lighting must be carefully maintained, and steps taken to avoid dark hiding spaces for criminals near entry areas. Deadbolt locks and window bars must be kept in good repair. Claims against property owners who allow some tenants to smoke have gained in popularity recently, and judges are recognizing these claims as legitimate. Phasing out smoking offers other benefits, too, like fewer cigarette-related fires. Extremely high verdicts have come down against landlords in cases where children have been exposed to poisons that were meant for bugs. While landlords may feel some skepticism about “green” pest control methods, it is important to avoid DIY pest control treatments and to enlist experts to apply state-of-the-art treatments. For example, steam heat is proving effective against bedbugs without the risk to human live. Screening maintenance workers is a crucial step in avoiding liability. Be particularly diligent screening employees who will have access to unit keys or tenants’ personal or financial information. Choosing tenants carefully is key, whether multi-family buildings or single-family homes. Landlords must run tenant screening reports to avoid bringing a person with a history of crime or violence into the community. Tenants, likewise, must be cautioned not to give access to their unit or common areas to risky guests. Maintaining the appropriate level of liability insurance can help landlords avoid income loss. It is also crucial to maintain records of ongoing property management. Good record-keeping can go a long way towards vindicating a landlord accused of neglect. Next post: Landlords: What Are Your Tenants Saying About You Online?